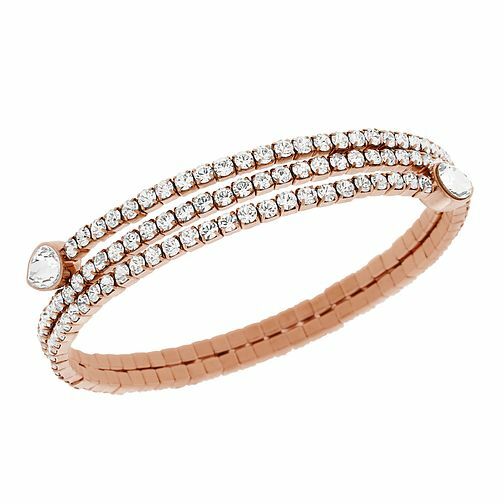 Combining beautiful rose gold-plate and glittering Swarovski crystals, this elegant double wrap bracelet is simply timeless. Adorned with pear-shaped crystals at either end for an elegant finish. Wear alone or with other bracelets for on-trend stacking style. Swarovski Twisty rose gold-plated crystaldrop bangle is rated 5.0 out of 5 by 2. Rated 5 out of 5 by Anonymous from A stylish piece of jewelry I bought the bracelet as a present for my niece's twenty first birthday. She loved the bracelet and is something I hope she will wear for many years to come. I made the purchase online, the whole process was simple and the delivery was prompt.